Hospital doctors and nurses must be encouraged to do research at the same time as they are treating patients. There is no need for Israeli hospital doctors to conduct medical research, a senior Finance Ministry budgets official told me about a decade ago. But without encouraging their doctors and nurses to perform basic and applied research, the hospitals would find their level of medicine falling behind. Innovations in pharmaceuticals and medical devices provide a significant boost to the Israeli economy that would be lost if research were not encouraged. New medical technologies and techniques can be moved quickly from the lab bench to the patient’s bedside and provide better treatments. In addition, as Israel has such a heterogeneous ethnic and genetic population, there are medical discoveries that can be made here that would not be made abroad. With its affiliated Hebrew University Medical Faculty, the Hadassah University Medical Center has long encouraged its medical staffers to conduct research, even giving them time off from patients to work in the lab. As a result, it has a large number of studies published in prestigious journals. But Hadassah isn’t the only research hospital in Jerusalem. Two years ago, Shaare Zedek Medical Center (SZMC) held its first research conference, inviting staff to send in their accomplishments to an impartial judges’ panel that assessed their anonymous presentations and choosing the best. A 186-page book of 165 abstracts of the research was published by the hospital. Posters along the corridors of the fifth floor of the building summarizing their findings made interesting reading. Prof. Dina Ben Yehuda, the new dean of the medical faculty as well as head of hematology at the Hadassah Medical Center, came to the Shaare Zedek conference to congratulate and encourage the researchers. THE MOST sensational piece of research presented at the conference – which won the number-one research prize – was by Dr. David Smadja, ophthalmologist from Shaare Zedek Medical Center. He and his colleagues and partners, Prof. Zeev Zalevsky, from the faculty of engineering and Prof. Moshe Lellouche, from the chemistry department of the University Bar-Ilan invented and patented “nanodrops” as well as eye treatment procedure that when applied on pigs’ corneas in their lab– have produced improvements in short-sightedness, long-sightedness and also allowed to cope with presbyopia. If this technology demonstrates efficacy in refractive errors correction in human eyes (clinical trial expected around summer 2019), this might be an exciting alternative to other visual correction like glasses or contact lenses. The researchers team developed these eyedrops at BIU’s Institute of Nanotechnology and Advanced Materials, and predicted that this technology could disrupt ophthalmic treatments options for patients with myopia (nearsightedness), hyperopia (farsightedness) and other refractive errors. “This is a new concept for correcting refractive errors,” Smadja added. The procedure developed by the research team includes putting eye-drops filled with biocompatible nanoparticles, after the epithelium cornea cells of the patient have been patterned by a laser ablation, in order to modify the trajectory of the incoming rays of light passing through the cornea and therefore correcting their refractive errors. This has already been done successfully on fresh pig eyes. The researchers still did not commit on the periodicity at which the drops would need to be applied to replace eyeglasses. • Dr. Avi Tsafrir looked into the question of why women with fertility problems keep choosing to undergo in-vitro fertilization treatments in which they have only a faint chance of getting pregnant. There are more than two dozen general hospitals that offer IVF. At age 43 to 45, they know they have very little chance of success and they are told this by their doctors. “But the women believe – despite the odds – that they personally have a higher chance than the average. They say they don’t believe in statistics. We have to explain to them that to have a child, they will need to get an ova donation, but it doesn’t help,” said Samueloff. • Prof. Ephrat Levy-Lahad, director of the hospital’s medical genetics institute ,who supervised the research, urged that all women of relevant ages of Ashkenazi origin be tested for BRCA status. “It would cost only about NIS 40 for the blood test,” she said. “Since the research showed a better prognosis for identified carriers, widespread testing would be beneficial.” However, she added, genetic counseling for so many carriers would cause a logjam in the system. • Dr. Benjamin Koslowsky of the digestive diseases institute reported that when colorectal cancer is diagnosed in patients under the age of 50, the tumor usually is usually of a higher grade and different clinical characteristics than in older patients who are at higher risk for colorectal cancer. • A variety of studies led by Prof. Ari Zimran dealt with patients with Gaucher’s disease – a serious genetic disorder more common in Jews that results from not having enough of the enzyme glucocerebrosidase needed to break down a fatty chemical called glucocerebroside. Because of this problem, cells build up in the spleen, liver and bone marrow, causing havoc in the body unless the synthetic enzyme is taken. The effects of hip arthroplasty, pregnancy and other situations in Gaucher’s patients were researched. • Dr. Assaf ben-Shoham of the internal medicine department looked into what happens to patients who are kept on beds in the department’s hallways when it is very crowded and they have to wait for a bed in a ward. Surprisingly, this situation caused a decrease in death rates among patients during hospitalization and no difference in their length of stays, but they did result in an increase in rehospitalization after they were discharged. • SZMC cardiologists who collaborated with colleagues from Ben-Gurion University and Soroka University Medical Center in Beersheba found that routine blood tests during pregnancy could predict heart disease years later among women who had no medical problems while carrying their fetuses. • Dr. Ariel Rokach and colleagues at Shaare Zedek’s pulmonary institute studied 153 fire fighters in Jerusalem over a period of two years and evaluated their lung function, given the fact that they are constantly exposed to smoke. Surprisingly, they did not generally find a decline in their lung function, but the smokers among the men in red did suffer such a decline. • Ultra-Orthodox (haredi) mothers of children with type-1 diabetes were studied by Dr. Ahuva Spitz and colleagues, who found that the women knew very little about the disease and how to cope. After experts held educational group sessions with the mothers to explain about the disease, their knowledge was greatly increased, thereby helping them to cope with it. The mothers asked for the sessions to continue; research on whether the participation of fathers in such sessions was suggested. • Dr. Rivka Nikkhou-Abeles and colleagues compared the competence of doctors and nurses in talking to patients and families about terminal illnesses. The study found marked differences between doctors, who were much more equipped with communication skills in this situation, than nurses, and suggested a need to train nurses better for end-of-life dilemmas. • Keeping in touch with discharged patients who underwent surgery at SZMC was endorsed by Annika Schwarz, a senior nurse. She and her colleagues made phone calls home to 400 patients aged 12 to 85 who had had complicated surgery and asked them questions about their condition, pain, temperature, diet and resuming their activities. An analysis of questionnaires showed the vast majority who were called were very pleased by the phone contact, which proved beneficial as follow-up. “We believe that there is nothing that can replace personal contact. Just pick up phone and call,” advised Schwarz.• Prof. Alberto Gabizon, head of the oncology department, reported on his 35 years of research into the use of fat globules called liposomes to deliver engineered nanoscale cancer drugs to tumors. Using such a delivery system, he said, brings chemotherapy to the tumor without harming healthy cells in the heart. WHEN “STATE-OF-THE-ART Guest Lecturer” Prof. Amnon Shashua of the Hebrew University, who was scheduled to speak for some 20 minutes about his Mobileye company (for preventing road accidents) caught the flu, SZMC director-general Halevy volunteered to fill in. 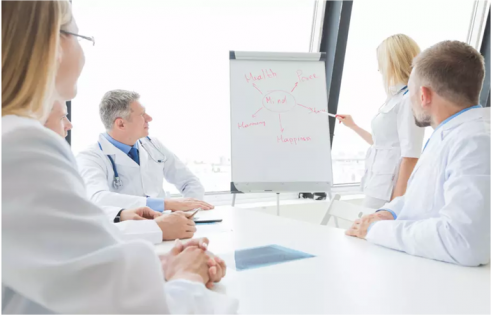 Amazingly, with two hours’ notice, he managed to prepare an original lecture and accompanying slides on integrative complementary and alternative medicine (CAM) – even though he is an internal medicine and liver specialist not especially enamored with CAM. CAM includes giving supplements such as vitamins, herbs and food additives; chiropractic and osteopathic treatments; body/mind treatments such as meditation, biofeedback, hypnosis, prayer and directed imagination; and acupuncture, reiki, magnetism and homeopathics. Many parents with children suffering from chronic illness such as asthma take them to CAM practitioners because they are worried about side effects from conventional medicine, Halevy said. The public health funds encourage members to go for CAM, because they make money from it; it is cheaper; they are interested in their members’ desires and they find members are satisfied, said Halevy. However, it’s vital that people first go to physicians to make sure that no medical complication has been overlooked. Halevy, who about a decade ago wrote a book on the proven and unproven successes (and mostly failures) of CAM, said that “most of CAM is the placebo effect” – the beneficial effect produced by a placebo drug or treatment that is due to the patient’s belief in that treatment. Every oncology department offers emotional, spiritual and other support to reduce patients’ suffering. The benefits of CAM are that practitioners have much more time and attention for their patients; it is holistic; and patients disappointed by conventional medicine are generally satisfied with CAM. SZMC has long had an integrative medicine department headed by Dr. Menachem Oberbaum, and Halevy has been impressed by some patient encounters he witnessed.